Join us in Memphis on January 5-8, 2019, as we celebrate Elvis’ Birthday with four days of events, including an unforgettable fan experience featuring one of Elvis’ closest friends, Jerry Schilling. It is a special time to be in Memphis as Graceland will still be decorated for the holidays and there will be an epic birthday cake on display on January 8. Join Elvis' close personal friend Jerry Schilling for an unforgettable, unique Graceland experience during the 2019 Elvis Birthday Celebration. Jerry first met Elvis in 1954 and they developed a friendship that lasted a lifetime. From personal moments with Elvis spent at Graceland, to concert tours throughout the US, to a secret visit to the White House, Jerry was there. 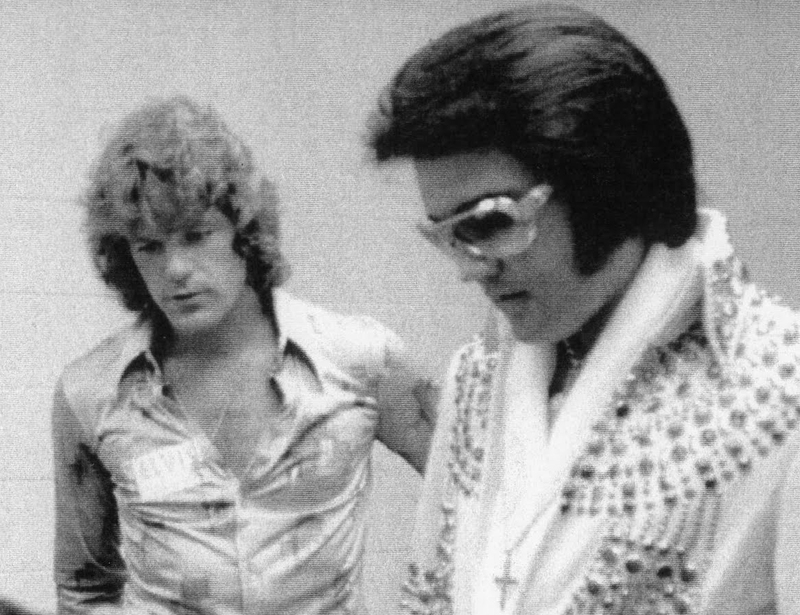 As part of this first-ever birthday package featuring Jerry Schilling, fans will get an insider look at what life was like with Elvis as told through the eyes of one of his closest friends. The My Friend Elvis package includes two nights at The Guest House at Graceland plus exclusive package-only events, including a cocktail party, show & tell event, private movie screening and more. VIP guests will also enjoy an intimate dinner with Jerry plus special reserved seating at the show and tell event, private mansion tour lead by Jerry Schilling and Angie Marchese, and a photo opportunity in front of Graceland mansion. *rates are based on double occupancy; extra charge for additional guests in the room; maximum of four guests in room; does not include taxes and fees. $250 non-refundable deposit due at time of booking; remaining balance due 2 weeks before arrival. Watch the Hallmark Channel Original Movie, "Christmas at Graceland," which was filmed at Graceland in the summer of 2018, at The Guest House Theater! FREE. Limited seating available on a first-come, first-served basis. Exclusive to My Friend Elvis Package holders. Exclusive to My Friend Elvis VIP Package Holders. Terry Mike Jeffrey joins the Memphis Symphony for his salute to the music made on Elvis Presley Boulevard. Tickets on sale through the Memphis Symphony Orchestra by calling 901-537-2500 or by visiting MemphisSymphony.org. Get to know the personal side of Elvis Presley with a special storytelling event featuring one of Elvis’ closet friends, Jerry Schilling. Jerry will share personal stories and favorite memories from his time spent with Elvis. Angie Marchese, VP of Graceland Archives & Exhibits, will also join Jerry on stage to share artifacts and photos from the Graceland Archives that tell the story of their friendship and time spent together. $129 for adults; $109 for children(ages 5-12); children under 5 are not permitted. See where it all began with an excursion to Elvis’ birthplace - Tupelo, Mississippi. Enjoy lunch at Vernon’s Smokehouse before hopping aboard the Graceland Excursions bus along with special guest host Tom Brown for a trip down highway 78 to Tupelo. On the ride, enjoy trivia, prizes, music and much more! Once you arrive in Tupelo, enjoy a driving tour to see some significant Elvis landmarks like the Tupelo Fairgrounds, the Elvis Homecoming Statue, Tupelo Hardware and schools that Elvis attended. After the driving tour, the group will be off to the Elvis Presley Birthplace where fans will enjoy a meet ‘n’ greet with Elvis' childhood friend Guy Harris before exploring the grounds which include Elvis' birthplace, a house built by his father for $180, the Elvis Presley Museum, Elvis' childhood church, the "Walk of Life" trail tracing Elvis' career and personal life, the "Elvis at 13" statue, the Elvis Story Wall and the Fountain of Life. At 4:00 PM, the bus will depart for the trip back to Memphis. This event is now sold out. Jerry Schilling will take fans on a personal tour of Graceland Mansion, along with Angie Marchese, to hear some of his favorite memories of time spent at Graceland with Elvis. Before your tour of Graceland mansion, enjoy a special photo opportunity with Jerry Schilling on the front steps of Elvis’ home. Enjoy a screening of Elvis fan favorite film "Viva Las Vegas" while singing along to some of your favorite songs from the movie, including "Viva Las Vegas," "The Lady Loves Me," "C'Mon Everybody" and more! FREE. Limited seating available on a first-come, first served basis. One of Elvis’ favorite ways to spend time with family and friends was renting out local movie theaters for late night movie screenings. Watch fan favorite tour documentary “Elvis on Tour” with a special introduction by Jerry Schilling, who was assistant editor on the film. 9:30 p.m. – 11:00 a.m. Enjoy a classic Memphis breakfast buffet at The Guest House while enjoying special Elvis programming. Host Tom Brown will welcome first-time guest Charlotte Stewart, who co-starred with Elvis Presley in the 1968 movie “Speedway.” Charlotte also starred as Miss Beadle in "Little House on the Prairie" and as Betty Briggs in "Twin Peaks." Charlotte will share some of her favorite memories of being on set with Elvis. Advanced reservations only. Tickets are available online at Graceland.com or by calling Graceland Reservations at 800-238-2000 or 901-332-3322. Elvis Presley fan club presidents and members are invited to join us as we celebrate what it means to be an Elvis fan through this new special event that will feature fans stories, prizes, competitions and more, hosted by DJ Argo. A great way to celebrate what it means to be an Elvis fan! Official Elvis Presley fan club presidents will receive additional information about this event through email. This event is open for all to attend. Founders members only event. Founders will receive email with additional details. $70 for adults; $40 for children (ages 7-12); children under 6 are free. Celebrate Elvis’ birthday with a party at Elvis Presley’s Memphis and a private evening tour of Graceland Mansion decorated for the holidays. The special evening tour of Graceland Mansion will include the iPad tour and Elvis Christmas music playing throughout the mansion grounds. At Elvis Presley’s Memphis, dance to Elvis music by DJ Argo at Presley Motors while enjoying complimentary hors d'oeuvres and cash bars, stop by the Graceland Archives Exhibit for Elvis trivia, see the newly-expanded Presley Cycles and ICONS exhibit, or watch Elvis on the big screen inside the Graceland Soundstage. Advanced reservations only. Tickets are available online at Graceland.com or by calling Graceland Reservations at 800-238-2000 or 901-332-3322. Enjoy a ceremony with Graceland/EPE officials, a birthday cake cutting and proclamation of Elvis Presley Day by Memphis and Shelby County officials. Fans who are unable to attend can watch the ceremony live via Elvis Presley's Graceland Livestream. Complimentary birthday cake and coffee served at Vernon’s Smokehouse, located across the street from the mansion at Elvis Presley’s Memphis, immediately following the ceremony. Fans and collectors from around the world will have the opportunity to participate on-site and online for this auction, featuring artifacts authenticated by Graceland Authenticated. All of the items in the auction will be offered from third-party collectors and none of the items included in the auction will come from the treasured Graceland Archives. The mansion and all artifacts in the Graceland Archives continue to be owned by Lisa Marie Presley and are not for sale. All of the items in the auction have been thoroughly authenticated by Graceland Authenticated, the Graceland affiliated authentication and appraisal service for collectors and fans. Registered bidders can reserve a paddle for in-person bidding by emailing [email protected]. Advance registration is recommended. Online bidding starts in December. To register and bid online, visit GracelandAuctions.com. For more information about auction registration, auction fees or how to submit items for consideration by Graceland Authenticated for future auctions, visit Graceland.com/Auctions. Tours of Graceland Mansion and Elvis Presley’s Memphis will be available daily. Guests who tour will be able to see the newly-on-display white, Knabe baby grand piano in the famous Music Room, which itself will be restored to its original 1960s-era. Graceland Mansion will be decorated for the holidays indoors and out through January 9. Visit the Graceland Tickets page for prices and details. Daily throughout the year there is a period of time for free-admission walk-up visits to the Meditation Garden at Graceland, where the grave sites of Elvis and members of his family are located. Then the area becomes part of the regular ticketed Graceland Mansion tours for the rest of the day. The winter hours for free walk-up visits are 7:30 a.m. - 8:30 a.m. daily. During the Elvis' Birthday Celebration, there will also be nightly walk-ups from 6:00 p.m. - 8:00 p.m. on January 5, 6 and 8. Meet Elvis artist Betty Harper at The Guest House at Graceland Gift Shop! See her latest work and buy your favorite piece of artwork. There will be a $5.00 facility fee charge per ticket. This includes orders made over the phone, online or in-person. 10% Insiders discount does not apply to Elvis' Birthday Celebration event tickets. All guests, times, prices and details are subject to change. Tickets for the Memphis Symphony Orchestra event are sold by their office and are subject to their taxes, fees and terms/conditions.